I have posted this picture before. I donated it to a Cancer benefit in our area. It was bought for $150.00. I had more money in the material and quilting than that. The lady that ran the benefit could not believe someone who wanted it right away would only donate that amount. She told me to look at it that I did the right thing by making it and donating it and that is what is important. The good thing from it is it is going to be hung in our local hospital Cancer Office. I hope people that come in will enjoy looking at it and give them some comfort. Last edited by skowron5; 08-07-2013 at 06:43 PM. it is really beautiful, people have no idea of all the work that goes into a quilt. Well at least it is going to be displayed. It is gorgeous! Your quilt is beautiful. Maybe it can be a consolation that many, many people will enjoy the beauty. I agree that your quilt is beautiful!! I remember you posting it a ways back, before it was completely finished, I think. I loved it then, and I love it now. I have been lucky with the two quilts I donated to charity auctions, but after reading many comments like yours, I have decided from now on that I will just donate money and forget about donating a quilt. Only quilters really appreciate what a quilt is worth. Again, your quilt is beautiful. It also looks like it was a LOT of work!! Beautiful quilt and a lot of work. I guess some people don't realize how much work goes into a quilt, especially one like this. Good job. Your quilt is beautiful and should have brought much more. This is exactly the reason why I won't donate quilts to silent auctions. I send $ to those that I wish to assist or I send things like an apron (which I stitch) and a cookbook or a home crafted child's Hallowe'en costume. I've seen the costumes sell for more than the quilt and they were made of poly/cotton and were stitched in an afternoon! More $$$$ is usually made by raffling off the quilt....you did beautiful work for a worthy cause. 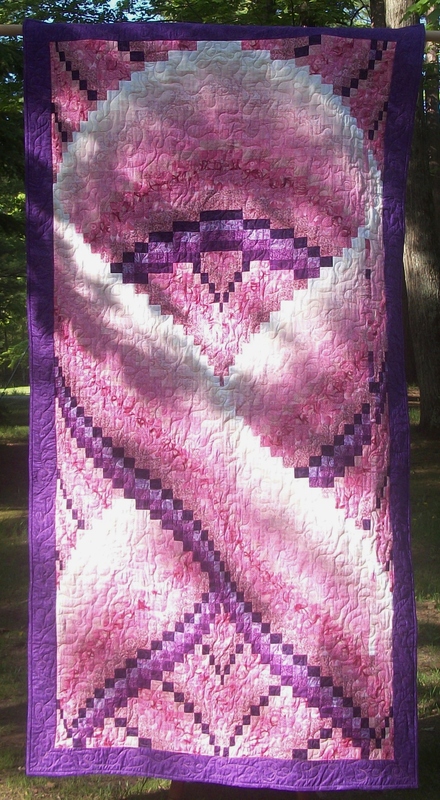 A stunning quilt and a generous act! Maybe someone will 'pay it forward'. The quilt is stunning! I would have put a starting price for the amount of money you had in it that way you at least know they got the money you put into it. You do a wonder job and thing donating it, so feel good about it and enjoy visiting it! I agree, maybe a minimum bid would be a good idea in the future. Don't let it deter you, however. Not all auctions go that way. I was privileged enough to contribute to a charity auction quilt several months ago. I made a 5" feathered star that was part of a larger quilt. It ended up getting auctioned for close to $8000. It's gorgeous! And at least you can deduct the cost of fabric and supplies on your taxes. BTW when I slowly scrolled down to look at the pic I thought it was going to be a Bargello made to look like a hot air balloon - give you any ideas? This was not bid for. The person who wanted it saw it before it was even done and said she wanted to purchase it. One thing is she familiar with quilting, she is well known in the community and has money so we thought we would do better than putting in a silent auction. Believe me I never would have not given a starting price is I had known. She also knows me and had an idea how much I had put into it. I guess that is why she has money. It is stunning. The top part looks like a hot air balloon, so patients can sit and contemplate and imagine the lovely balloon is carrying them away from pain and illness. This was a very generous donation. Don't let your beautiful act of kindness be soured by the dollar amount. Enjoy knowing that you helped a cause, and that your quilt will continue to comfort and inspire patients. It's beautiful. One time, I ran the bids on a quilt at a charity event up to $350 (should have been more) just because I knew that the lower bids were not representative of the work that went into the quilt. You did a noble and wonderful thing to donate, and I'm glad the quilt will be hung where it will help the patients. The old biddy who bought the quilt sure took advantage of the situation and to get the glory of having donated it to be hung, probably with her name in big letters. Sure the quilt was for charity but still it's a slap in the face from someone who showed her true colors. Forgot to say the quilt is beautiful! All who visit the office will get to enjoy the beauty of your quilt. It really is beautiful. OUCH!! No wonder you are upset! Next time (if ever) - put a minimum price on it or it comes back home with you! What a ***** - although I really hate to insult the canine species with that comparison. Had to look twice before I realized that it represents a pink ribbon - It's a lovely piece.